Enzymatic Therapy Mega-Zyme systemic enzymes provides a high potency pancreatic enzyme complex to support healthy digestion of fats, carbohydrates, and proteins. They contains a full-strength pancreatic extract for optimum digestive support. Mega-Zyme is formulated with MAX-strength enzymes to help relieve muscle soreness and discomfort due to overexertion and exercise. Mega-Zyme, when taken with food, can also help support optimal digestion as well as help with digestive discomfort from occasional gas and bloating. Systemic enzymes serve to break down protein based foreign bodies, such as bacteria, viruses, fungi, and parasites. As blood cleansers, these enzymes combat chronic inflammation, which can lead to autoimmune diseases, cardiovascular disease and even cancer. Mega-Zyme breaks down foreign proteins in the blood that cause inflammation and facilitating their removal through your blood stream and lymphatic system. They remove excess fibrin, a clotting material that can prolong inflammation, and reduce edema in the inflamed regions. All diseases caused by inflammation, practically every chronic disease we face today,can be benefited by taking these systemic enzymes. Directions: To relieve muscle soreness and discomfort due to overexertion and exercise, take two tablets two to three times a day between meals. To support optimal digestion, take two tablets before each meal. 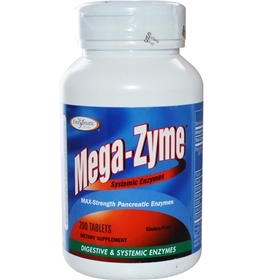 Notes:Mega-Zyme contains undiluted pancreatic enzymes which deliver 10x the strength specified by the United States Pharmacopeia. This product is not intended for children. If pregnant, nursing, or taking prescription drugs, consult your healthcare practitioner prior to use. Other Ingredients: cellulose, potassium bicarbonate, modified cellulose, modified cellulose gum, magnesium stearate, silicon dioxide, soy lecithin, and carnauba wax.